Nietzsche seemed the favorite philosopher of the counter-culture in the 60s and 70s - probably what the Wilson cartoon was parodying. Nietzsche is one of those writers whose complete works I hope to eventually read. I haven't read 'Anti-Christ' yet, but it just moved to the top of the list. "Twilight of the Idols" is a good one. I also really like "The Birth of Tragedy," "Thus Spake Zarathustra," "The Gay Science," "The Genealogy of Morals," and "Ecce Homo." Nietzsche was a fascinating character who always remained cheerful and affirmative toward life (until he lost his mind) despite the constant presence of debilitating illness, hence his most famous quote: "what doesn't kill you makes you stronger." .... just a second, there's a robot here who wants to take me home... lol. Nietzsche was also a huge influence on Freud, Crowley, Gurdjieff, Picasso, Dali, Joyce and several other contemporary icons. His concept of 'amor fati' - love your fate - strongly resonates with me and seems related to 'do what thou wilt.' For a general overview of his philosophy, I would be remiss not to mention "Nietzsche and Philosophy," by Deleuze which contributed significantly to his revival in the '60s. Tom, I think reading Nietzsche will help you immensely in understanding Wilson's methods of destabilizing the reader - "guerilla ontology". It seems to me that Plato and Socrates started the process of deconstruction by questioning their readers. 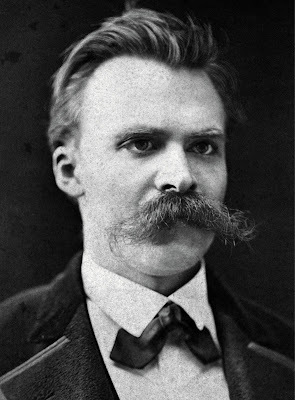 Nietzsche seems to intensify the process and almost demands from his readers to think for themselves. (I think Nietzsche enjoyed destabilizing his readers.) And it all led to french deconstruction and Derrida, and to Wilson. If I may, I'd suggest "Thus Spoke Zarathustra". I meant to say in my posting (and of course, I forgot) that RAW's recommended reading list, and Eric's annotations to them, are a very valuable component to Eric's book. His book is only $4.99 for Kindle, and with a Kindle app, you can stick it on your phone for easy reference. Thanks for the kinds words, Tom. I also enjoyed "The Portable Nietzsche". I find it interesting how Nietzsche pops up in popular culture. The line "God is dead" from "Also Sprach Zarathustra" inspired the Christian movies "God Is Not Dead" and "God Is Not Dead 2". (I love the latter title.) Also, that book inspired Richard Stauss's tone poem of the same name which Kubrick used in "2001". The use of that music in that film made such a profound impact that that music keeps showing up in films and advertisements, such as in an Oreo Thins ad last year. Reading "In Defense of the Damned" again convinces me that I'm correct in assuming that RAW would have been an Edward Snowden supporter. One of the reasons I liked Gary Johnson in the last election was that Johnson promised to pardon Snowden. Kaufmann's biography of FN is not only a great read but it sheds some background light that for me was necessary to understand FN. I initially found much of FN's work inaccessible until I read the bio.